Ste-Catherine street is the main tourist and shopping destination in downtown Montréal. The part west of Boulevard St. Laurent is where all the interesting stuff starts. The eastern part has traditionally been less glamorous and somewhat grittier. On a recent visit to that part of downtown we decided to head east and stumbled upon a few old churches that had totally slipped from my memory. 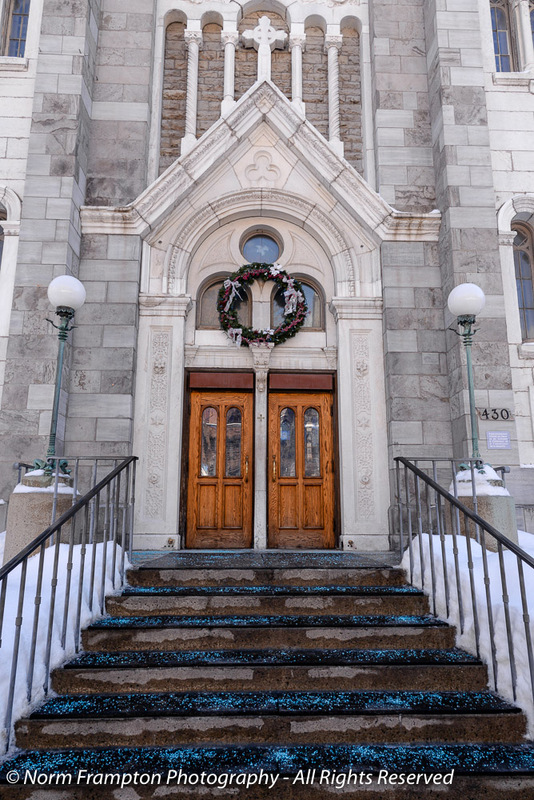 Église Unie St-Jean (St. John’s United Church) is one of the city’s rare French language Protestant churches that has been serving its community since 1841. Without my wide angle lens it was impossible to get a shot the entire building from the sidewalk. Parked vehicles on both sides of the street made crossing the street to try from there well…pointless. The building and the main door could use some TLC, but I did like the way the door is cut into the corner of the building. 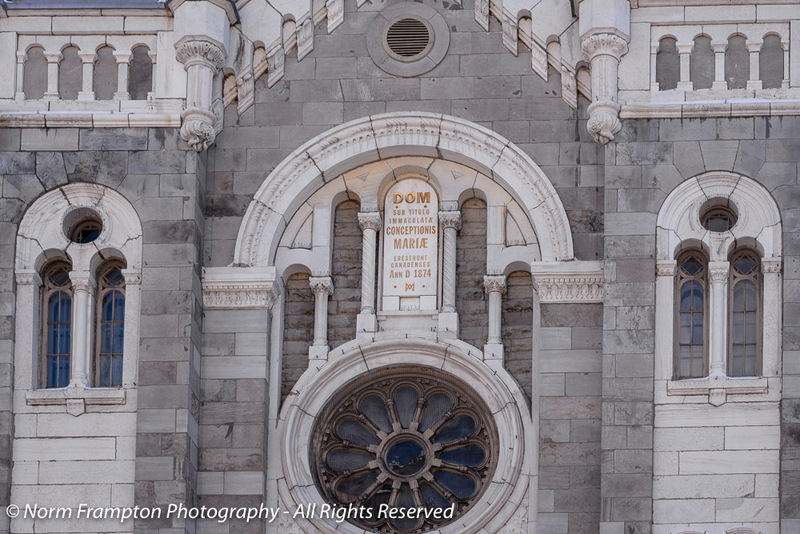 Built between 1873 and 1882 this Catholic church sits on the edge of the city’s Latin Quarter. 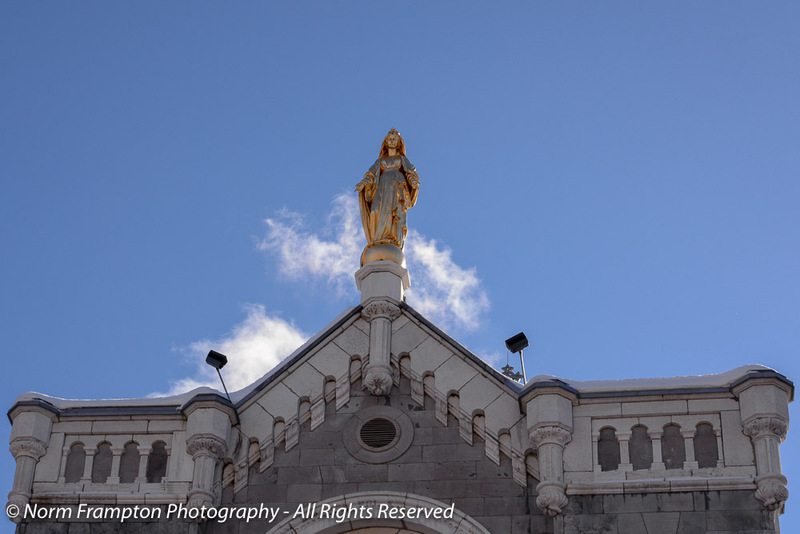 The main exterior feature is its nine-foot tall bronze statue of the Virgin Mary covered in gold leaf. If was originally installed in 1904 and lovingly restored exactly 100 years later. With the late morning sun glowing off her back, she sure is a sight to behold. I’ve been in this building a few times some years ago, and wanted to go in again to capture some of the beauty of the interior but alas, it was not open to the public on the Monday morning when we were there – perhaps another visit is in order. 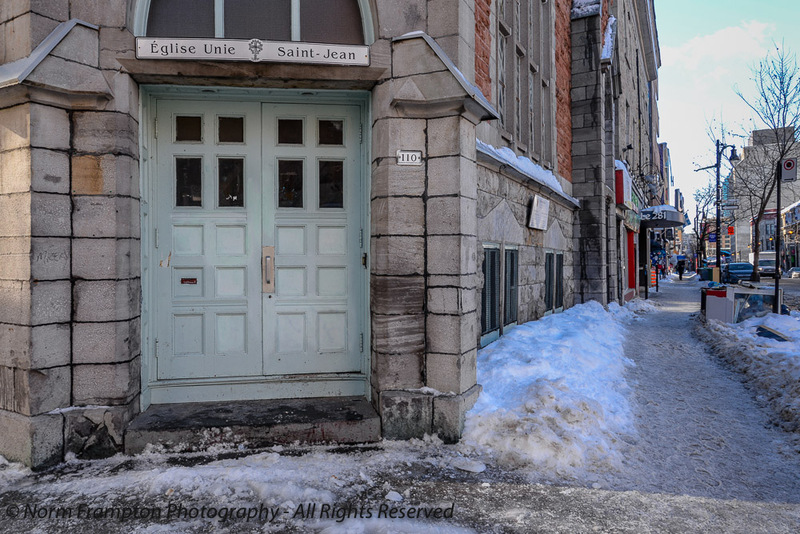 Gallery | This entry was posted in Photography, Thursday Doors and tagged Canada, Centre-ville, Doors, Downtown Montreal, Montreal, Québec, Ste-Catherine St., Thursday Doors, Winter. Bookmark the permalink. The corner door was a great photo taken of the street, too! Not many door photos have the location so visible and close in proximity to the street. It’s magnificent! I love the gold leaf Mary on top, and the doors, and stone. I bet it’s just gorgeous inside too. Stunning architecture. 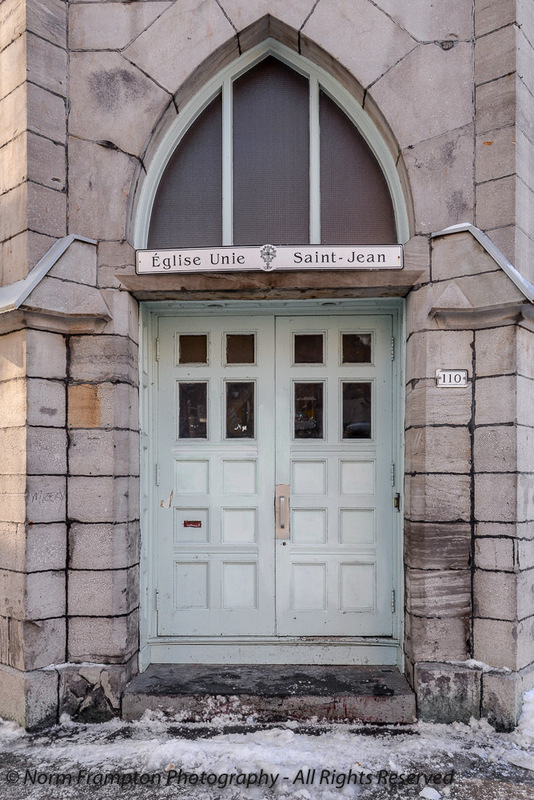 I love the color of the doors on Saint Jean, it’s super retro and utterly hip for a church. Thanks Joey – sorry for the delay. What wonderful buildings! I wonder why doors cut into the corners of buildings make me so happy? I don’t know, but they do. Thanks for sharing a particularly beautiful one. That catholic church is beautiful. I would hate to be the person to go up there to restore the Virgin Mary. That first church’s door is neat. Always such beauty in old doors. Thank you, Norm. That’s a couple of gems alright, especially the whole second church. Those Catholics… gotta hand it to them. They sure nail their churches. For Mary to be so tall on top of the building, she must be really tall when on eye-level! By the way love the view in your third capture! Can see on the snow in the street that it has been laying there for a while! Thanks for thinking about Thurs. doors even when you’re t in M. for other reasons! I like the way you caught the icy steps sparkling in the sun. Beautiful but looks a bit slick. Thanks Jan. Yes indeed the footing can be tricky at times. Every time I see your Montreal doors, I want to go there. I keep telling my husband Montreal needs to be our next vacation place! Thanks Carrie. There’s certainly no shortage of things to see and do, especially in the summer with all the festivals. Add a side trip over to Quebec City or Ottawa for a few days and you could easily fill a 10-14 day trip. I love it when the sky participates nicely in a photo. These are beautiful! I need to get back to Montreal one of these days. I think I’ve mentioned before, Norm, that my favorite doors are ones that are in the angled corner of a building. I really like that first door, even if it does need some love. The tall and narrow look of the Notre-Dame-de-Lourdes Chapel is stunning. Great photo and wonderful doors. Thanks Dan. Great minds think alike: corner doors are a fave of mine too. It’s always good to have something make a revisit necessary! Some great doors here as always and I love your wide shots (bins apart) that set the full scene. That darn recycling bin!!! I even thought of moving it for my shot but I decided not to touch it what with the snow and all. I’ll swing by to have a look at your post a bit later. I’m still making the rounds of the ones on the link-up list first. A pair of beauties, Norm. I think each would put you in just the right mood for church each time you attended. That green in the first photo is a particularly lovely mild shade. It’s weathering that’s produced that shade, isn’t it? I would be surprised if you could get a beautiful colour like that out of a can. The Chapel is especially lovely. I applaud the craftsmen in creating something that still catches our eye with its outstanding architecture. What strikes me the most about Notre-Dame-de-Lourdes is that it has the appearance of being a building with 3 floors – which would make it highly unusual for a church. Does it in fact just have really high vaulted ceilings inside? 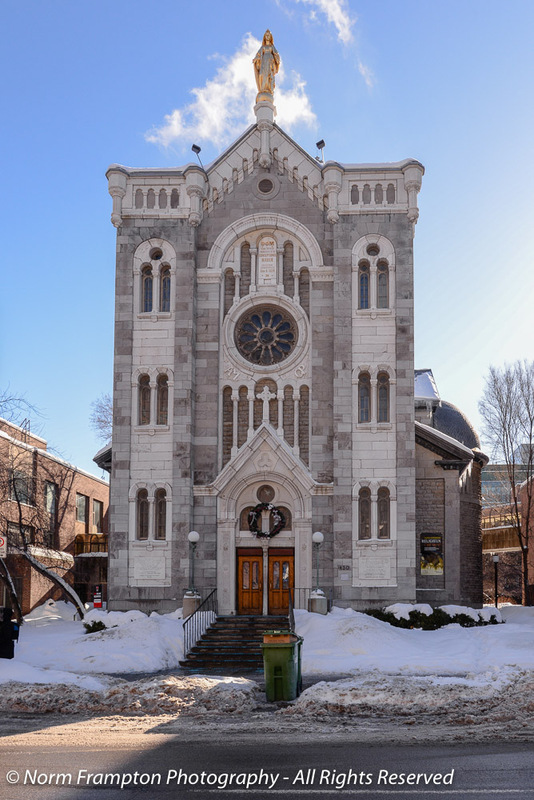 Quebec churches are just the best! Thanks for noticing this Joanne. Yes the vaulted ceilings are spectacular. You’ll see some good shots if you look it up online. In the front portion the extra height is to accommodate the pipe organ. This chapel actually has the Casavant Freres, OPUS #1 – the very first organ they made in 1879. I love a good pipe organ. It’s worth attending a mass just to hear the music!